Discover the powerful and complete solution for optimum health, by making simple changes to 10 important areas of your life! Most books providing health advice focus on one or two areas - usually just diet and exercise. And although these are important there are many others you should look at if you are to enjoy good health and live life to the full. 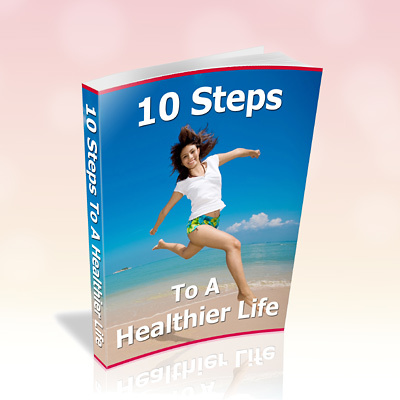 If you are ready to take control of your life, this e-book will show you a simple 10 Step Plan towards feeling healthier, younger, and more energetic than ever before. In '10 Steps To A Healthier Life' you will learn; * Why your body needs antioxidants and where can you find them * 6 simple, painless daily tips to keep a healthy heart * How to reduce sugar in recipes by two thirds - and keep a sweet taste * The science of losing weight - permanently * A natural way to boost your immune system to fight off colds, flu and other infections * 5 methods for treating wrinkles without cortisone * The 11 common foods or ingredients to stay away from that will surprise you * Simple tricks for making exercise a fun, daily part of your lifestyle * The Alexander technique to fighting stress * And much, much more . . .
Just by making small changes in your daily routine and attitude, you will not only feel better physically, but you will also develop that positive mental health that is so vital to enjoying a full and satisfying life. It doesn't matter whether you are young or old, male or female, the parent of baby or young child, - this book has the solutions you need to improve your health, and the health of those you love. Take the first simple step, now.